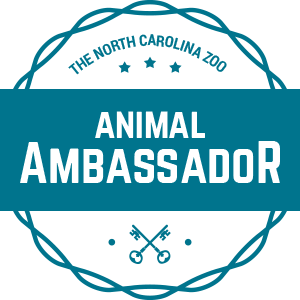 Our ambassador animals play an important role at the Zoo connecting guests to their species and other animals in the wild. Although not in a traditional habitat, you can frequently see them in animal encounters in Kidzone and other locations around the Zoo. They also play a leading role in education programs, birthday parties, and special events. Check out one of our education opportunities for a chance to meet and get up close with one of our ambassadors. They live in colonies, but males may defend small territories. Hissing sounds are used in courtship routines and as a defense mechanism. Sound is produced by pushing air out of tiny holes on the side of the body. Hissing cockroaches can run at a surprising three mph. Females give birth to live offspring after they have been carried in eggs within her body. After six molts, they are sexually mature. Madagascar hissing cockroaches are one of the longest roaches, reaching lengths of four inches. Although most people don’t want to see one roach, our keepers maintain a large breeding colony that requires daily attention. Every day keepers are on the lookout for unusual behaviors and feed them a wide variety of fruits, vegetables, and animal protein.